Van's Views - Hair, Beauty, Nails & Lifestyle Blog: How Much Product Should I Really Use On My Skin? Can I Save Time And Money?! How Much Product Should I Really Use On My Skin? Can I Save Time And Money?! Too much or too little, and you wont get the results you desire. Too little and the effects will be diluted, too much and not only are you going to end up wasting money but your skins likely to get clogged up. And when its clogged up it doesnt work efficiently, function breaks down and spots/oiliness/dryness appear. This may sound like an obvious thing to say, but read the box and read the little leaflet thats often found inside a good skincare product. Some companies spend billions in research a year, so why wouldnt you take advantage of their knowledge?! If you have access to a great skin care salon like mine, OMG Hair & Beauty, Swindon, make use of the services and skills on offer. Skin Scanning is an excellent way of understanding your skin, its condition and needs and when having your first facial/buying new products, ask for help in application and amounts. Typically, for each application, you shouldnt need more than a pea to five pence piece size of moisturiser for your face and neck. And as an example, for a Dermalogica moisturiser 50ml, I find that lasts 3 - 4 months on my clients. If you are finding that its not lasting long at all, rather than plastering huge amounts that just sit on top of the skin, you`d be better off adding a hydrating booster to your moisturiser or using a hydrating masque. Sometimes its not the moisturiser thats wrong, if you are using a cleanser that is too harsh or a toner that has alcohol in it, it will strip your skin of its natural oil and make it feel much more dryer. If your`e trying to save money or time, why not try dual action products such as a combined cleanser and exfoliator or a mosturiser that has SPF in it. 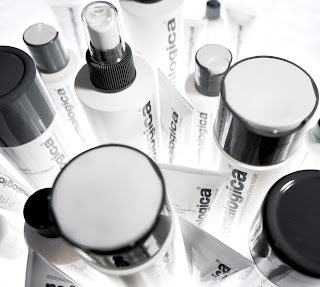 Some cleansers such as Dermalogicas Dermal Clay Cleanser can double up as an oil controlling masque. Apply masques with fan brushes, you will be so suprised at how much product you save. And watch out for gel based cleansers. Its so common for people to use it undiluted and waste product. Really combine it with lots of water and foam up well. Eye creams should be applied gently, around the orbital bone, rice grain size, with a gentle patting motion, using your wedding ring finger. Some eye creams can also be used for around the lip area, when you start to see those pesky little lines appear! I hope you`ve found this article useful, please post back with anyquestions or comments.